Well, even though it’s still November, I can hear those sleigh bells jingling (and ring ting tingling too). Yes, the holiday season is finally upon us, and although I’m loathe to acquiesce to this nascent trend of dusting off the yuletide albums and holiday decorations by early November, I suppose it’s pointless to gripe now that Black Friday has passed and we’ve all begun shopping for gifts and pepper-spraying each other. Therefore, the LA Winos are kicking off our annual series of holiday-themed tastings this Wednesday night with a unique twist on that mainstay of seasonal entertaining: sparkling wine. Although either white or red grapes (or both) may be used in the production of Champagne and the méthode champenoise wines it’s inspired worldwide, the resulting wines are usually white, the skins of the red grapes having been separated from the juice too early to impart any pigmentation. Other bubblies are done as rosés, wherein the red grapes are allowed to leave just a hint of their natural coloring behind. Both white and rosé sparkling wines of a certain price point (roughly $10 and up) carry some degree of respect: not everyone’s a rabid fan, perhaps, but no one finds them odd or funny-looking. Sparkling Shiraz from down under. In recent years, Australia’s bubbled reds have largely become the category’s de facto standard bearer to young American consumers. The good ones are dry, not sweet, and embody the best varietal characteristics of the Shiraz grape, i.e. fruit-forward, earthy richness. There are a number of good producers in Barossa Valley and McLaren Vale, including Samuel’s Gorge, whose winemaker visited us a few years ago. Reunite notwithstanding, Lambrusco is a grape that produces delightful and complex red sparklers which run the gamut from light and acidic to rich and brooding. Here’s an excellent article on Lambrusco that features suggestions of several bottles worth trying. Elsewhere. 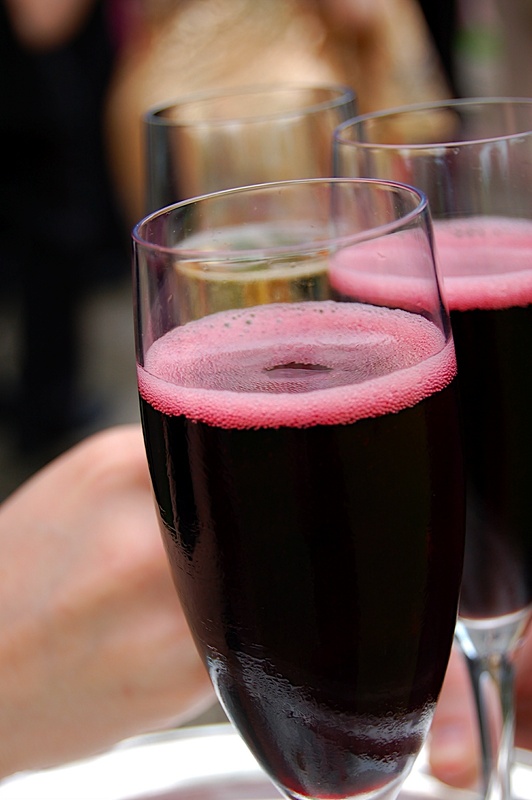 Red sparkling wine is made all over the world — Italy (i.e. Brachetto d’Acqui from Piedmont), France (i.e. Vin du Bugey-Cerdon from Jura), Portugal, and even Moldova. Also, respectable red bubbly is made right here in California: Geyser Peak and Wattle Creek both make good ones, and we’re big fans of the Municipal Winemakers sparkling Shiraz from Santa Barbara, the 2007 vintage of which we reviewed on this site. We’ll be meeting at Emily’s place in Manhattan Beach. The RSVP system functions like this: if you want in, you click on this link and tell me so (don’t forget your full name, e-mail address, and a cute message conveying to me your intentions), and I’ll send you a confirmation e-mail with the address. Once you’ve received your confirmation e-mail, go find an interesting bottle of sparkling red — or, as always, simply bring ten dollars. Can’t wait to see you festive youngsters on Wednesday at 8pm!